Created by Deviantart member TheTechnoToast, the Samsung Galaxy Aurora smartphone concept is more likely a futuristic phablet, something like Galaxy Note IV, if you want. It’s supposed to feature a new type of battery, much stronger than Li-Ion and this one is called L-Lion, with a power of 820k mAh, that’s just crazy. The battery has the same size of Li-Ion, but it can get very hot, so it’s surrounded by 11 extremely powerful nano fans, cooling the CPU inside and the battery. The GPU here is a PowerVR Series 5XT SGXMX20 with 12 cores and the Samsung Aurora seems to run Android 4.1 Jelly Bean, although I expected something more futuristic. I expect technology from the future 10 or maybe 20 years to be inside this device, so a 16 core processor wouldn’t surprise me at all. Also 128GB of storage, 5G connectivity and a 21MP camera are all specifications that come to my mind and I associated them to this model. 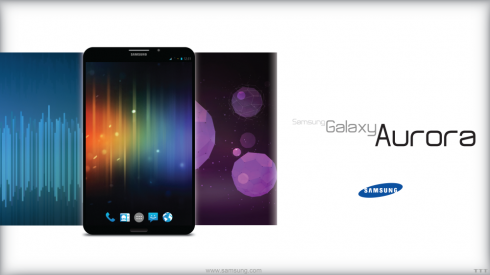 I hope the designer likes my ideas regarding his creation, but anyway frankly speaking I prefer this design to the real Galaxy Note II, that’s so predictable. Do you like this one more?